It’s amazing how a new hair part and red lips can give a girl a fresh perspective on life. I never thought I could rock a middle part OR red lips, but look at me, changing it up and looking like a whole new girl. The middle part was sort of an unexpected find. I’ve tried styling my hair like this before, but never liked the way it looked. One day while hurriedly getting ready, I accidentally went for the middle part and surprisingly liked the way it looked. I now find myself wearing it parted down the middle more often than not. Owning it. As for the red lips, before going on vacation in March, I bought a Covergirl jumbo gloss balm in Ruby Twist(245), as a way to ease in to the red. I liked that it wasn’t super bright and was more of a gloss than a lipstick, which allows me to ease into the next step of full on bright red lips. As for my outfit, this has definitely been my go to lately. The weather has been a little cooler, but humid, so I have been dressing in layered outfits that allow me to transition with the weather. I can already tell that this little sweater from chicnova is going to be a key player in my closet in the coming months. It’s super light weight and comfortable and is the perfect summer to fall piece. I’ve already worn it a million different ways, and love how versatile it is (it looks especially adorable over a dress!). 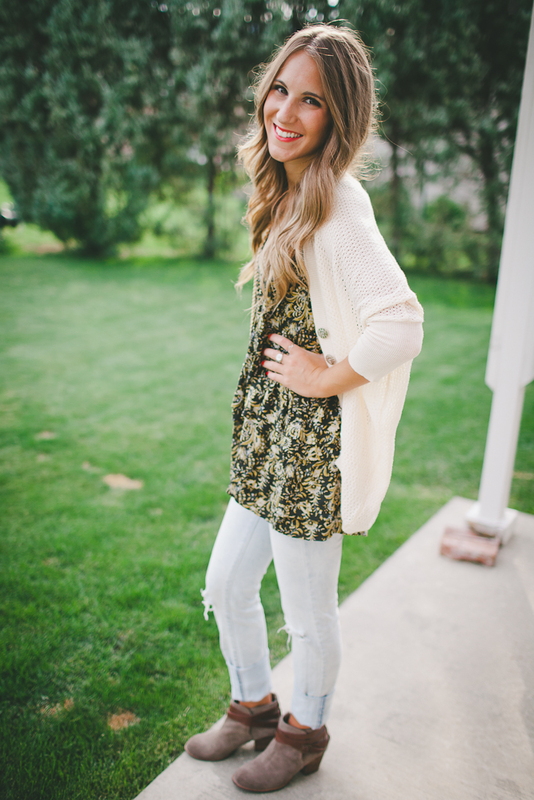 With my favorite free people tunic, some ripped jeans and my go to boots, I felt very fall-esque. Hold up though….that doesn’t mean I’m ready for fall justttttt yet. You better believe this girl is going to be milking her summer wardrobe for as long as humanly possible! I'm obsessed with that necklace! Hej! Very nice! 🙂 Look so pretty! Ah hay gurl, look at you rockin that chain 😉 You know, this outfit reminds me of a time when I went on a weekend getaway with one of my besties from college, it was super fun! We lounged by the pool, ate burgers, went shopping, saw another bestie, ate cheesecake (with two clean forks, and one not so much), and went to a bridal shower. Anywhoo…you look reaaaal purty! oh my goodness how gorgeous are you??? Perfect look, love the long cardi and the booties balance it out. And you hair is perfection! Okay, I was wondering why you looked a little different here… new hair? No. New hair part? Aha! Hehehe, you look SO good with a hair part in the center, Ashley! You look beautiful and gorgeous and like a princess all the time anyway, but gosh, you are so flexible in terms of hairstyles and outfits and such. You can pull off such an excellent variety of… well, everything! But anyway, I won't gush on your beautifulness too much (also also you have really pretty shaped lips and a really excellent chin, I just gotta say that yep yep). I love your lipstick here–so bright and pretty–and this outfit suits you so well. Oooh, look at you Ashley, switching it up like a pro! I am loving the red lips and middle part on you. Funny how the little changes can make you feel like a new person. I remember thinking to myself "I'm never going back to bangs" once I started wearing my hair in a side part. Now look at me. I feel like it's my signature look lol. If I had a sweater like that, I would be wearing it all fall long, too. But first we gotta get through this ridiculous heat. Also, that necklace is fabulous. Absolutely fabulous! I'm in love with that cardi, looks incredibly comfy and cozy! Okay I JUST got a tassel necklace, but it is a shorter version. NOW I WANT A LONGER version! This is so beautiful and you look so chic! 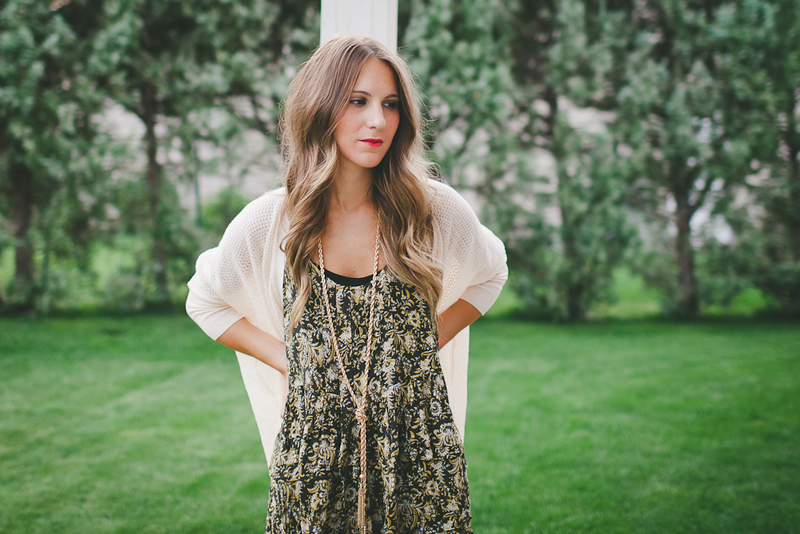 I am obsessed with this entire look – you're rocking it! What nail color? The sweater looks so cozy. I used to wear my hair in a middle part all the time. I love your boho chic outfit! Those booties are killer and I just picked up a similar cardigan from a thrift store just the other day! This top just went on sale at Nordstrom, what size are you wearing?